Baton Rouge National Cemetery is located within the city limits, roughly one mile southeast of the state capitol building. Due to its strategic location on the Mississippi River, the city of Baton Rouge was hit hard by the ravages of the Civil War. In 1862, Confederate and Union forces fought the bloody Battle of Baton Rouge for control of the city. The cemetery was established in 1867 as the final resting place for Union soldiers who died in the battle or in battlefield hospitals. Most of the cemetery structures date from the 1930s. Civil War soldiers and sailors are buried in the cemetery along with veterans of the Revolutionary War, War of 1812 and U.S. conflicts of the 20th century. In May 1862, Union naval and ground forces captured New Orleans without a battle, and moved north along the Mississippi River to secure Baton Rouge. Union forces encountered rebel guerillas, but were able to capture the city with little bloodshed. Three months later during the Battle of Baton Rouge, Confederate forces attempted to regain the capital through a combined land and water expedition. On August 5, 1862, two divisions of Confederate troops attacked the Union-held city from the east, initially forcing the Union to retreat along the banks of the Mississippi. However, Union ground forces, supported by artillery from gunboats in the river, ultimately repelled the Confederate advance. Confederate forces failed to regain Baton Rouge, and the Union controlled the city throughout the duration of the Civil War. Despite the short duration of the battle, causalities on both sides were high; 168 killed, nearly 600 wounded, and 90 missing. During the war, Union soldiers and sailors who died in battle or in the area’s military hospitals were buried at the present site of the cemetery, adjacent to the city’s Magnolia Cemetery. The U.S. government purchased the land for $3,600 in 1867, and the site was officially designated a national cemetery. Remains of Union soldiers from Camden, Arkansas, and Plaquemine, Louisiana, were later reinterred in the national cemetery. The cemetery, closed to new interments, contains nearly 5,000 burials. Most of the structures on the cemetery’s grounds date from the 1930s, including the main gate, superintendent’s lodge, and a utility building. The superintendent’s lodge is a one-story Colonial Revival building constructed in 1931, replacing the original lodge built around 1871. The date of construction for the cemetery’s rostrum is unknown, although photographic evidence shows that it was constructed before 1948. The style and construction materials suggest that the rostrum was built prior to the 1930s; the rostrum’s brick base with posts and steps of cast iron are more elaborate that other national cemetery rostrums built during the Great Depression. A brick wall replaced the original white picket fence in 1878. This wall remains in place today, although the brick was covered in stucco in 1962. 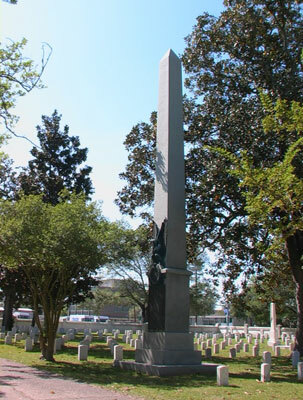 Baton Rouge National Cemetery has one commemorative monument on its grounds, erected in 1909 to honor Massachusetts sailors and soldiers who died in Civil War battles in the Gulf region. The granite monument is inscribed with the names of the Infantries and Light Batteries that served in the Gulf theater of operations. A notable burial in the cemetery is General Philemon Thomas, a veteran of the Revolutionary War and the War of 1812. Both Spain and the United States claimed the territory after the Louisiana Purchase, but Thomas captured Baton Rouge from the Spanish in 1810. Thomas served in the War of 1812 and returned to Baton Rouge after the war. He represented the state of Louisiana in the U.S. House of Representatives between 1831 and 1835. A large flat gravestone marks his grave in Section 3 of the cemetery, inscribed with a short history of his life and the Latin phrase “Sic tibi in terra levis” (“May the earth be light upon you”). 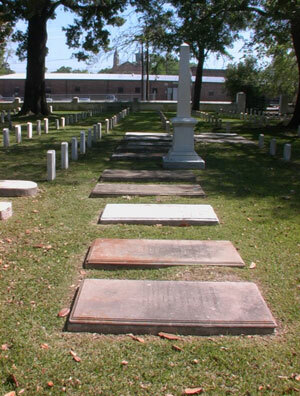 The Baton Rouge National Cemetery is located at 220 North 19th St. in Baton Rouge, LA. The cemetery is open for visitation daily from sunrise to sunset. No cemetery staff is present onsite. The administrative office is located at the Port Hudson National Cemetery, and the offices are open Monday-Friday from 8:00am to 4:30pm; the offices are closed on all Federal holidays except for Memorial Day. For more information, please contact the cemetery offices at 225-654-3767, or see the Department of Veterans Affairs website. While visiting, please be mindful that our national cemeteries are hallowed ground. Be respectful to all of our nation’s fallen soldiers and their families. Additional cemetery policies may be posted on site. Baton Rouge National Cemetery was photographed to the standards established by the National Park Service’s Historic American Landscapes Survey.